Gift your favorite brainiac this custom book, filled with 50 pages of puzzles, word searches, and crosswords. Give your favorite strategic thinker a personalized page turner with this custom puzzle book. 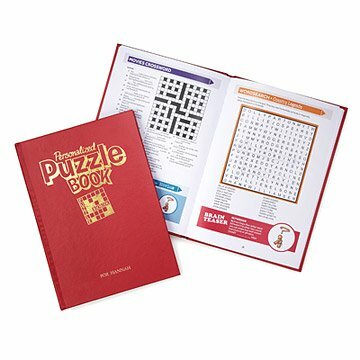 Filled with over 50 pages of multi-level word searches, crosswords, code crackers, Sudoku, and more, this hardcover book is printed with your brainiac's name on the cover. The book offers space for a personal message from you, along with a quiz based on the year you request, whether it's their birthday, your anniversary, or the date of their first spelling bee win. Made in the United Kingdom. This is a made-to-order item. If you order today your item will ship no later than 5/6/2019. Enjoyed the personalized touch to the book. Wish there was an option to choose the topics related to the puzzles. Great variety of puzzles and I especially like the fact that you can choose a year to be highlighted as a custom puzzle. I wish there was more than one page for the questions on the year you choose. Other than that it's great! Bought this for my friend who travels a lot for her down time on planes and ships. Love the customization. I'm sure the size was mentioned in the description but I overlooked it so I was a little surprised that its not as compact as i thought. I'd have still bought it.